Trust in or distrust of the US; which one is more sensible? Home Politics Foreign Policy Trust in or distrust of the US; which one is more sensible? The nuclear deal does not guarantee the termination of sanctions, nor does it offer any assurances that the country’s achievements will be safeguarded, the daily argues. The Joint Comprehensive Plan of Action does not guarantee the termination of sanctions, nor does it offer any assurances that the country’s achievements will be safeguarded. Swearing to God does nothing to deny these facts. After 40 days of review which involved veteran experts – both for and against the Joint Comprehensive Plan of Action (JCPOA) – well versed in politics and economy as well as cultural and technical issues, parliament’s JCPOA Review Committee presented a report to the Islamic Consultative Assembly. Immediately after the release of the report, a motion with double urgency status was put forth. The motion titled the Government’s Reciprocal and Proportional Action Bill on the implementation of the Joint Comprehensive Plan of Action was in no way a representation of the committee’s report. What stands out about the motion was that it negated four important acts of parliament ratified over the past decade; all four having to do with the country’s independence on security and technical fronts. These acts were a guarantor of the nuclear achievements of the country for which five nuclear scientists have fallen. What we have on our hands now is a text which offers no guarantee on the removal of sanctions; and no guarantee on safeguarding the country’s achievements and scientific independence framed in comments by the leader. Unfortunately, the logic supporters of the deal, especially the representative of the government put forth was wobbly. Mr. Salehi [the director of the Atomic Energy Organization who appeared in parliament to support the deal on the day the chamber debated the motion] swore to God three times that there would be no slowdown or halt in the nuclear program. His statements do not conform to the wording of JCPOA and its annexes. Supporters of JCPOA need to present evidence rather than swear to God. The shortcomings of JCPOA and the concessions we have made under the deal leave no doubt that JCPOA is no great achievement. But Mr. Salehi praised it as the jewel in the crown, a document government is unwilling to label as a deal, an agreement, an accord or a treaty. The logic of government and proponents of JCPOA is based on trust in the US, whereas there is no legal or logical ground in JCPOA or in the history of relations between Iran and the US to justify such trust. 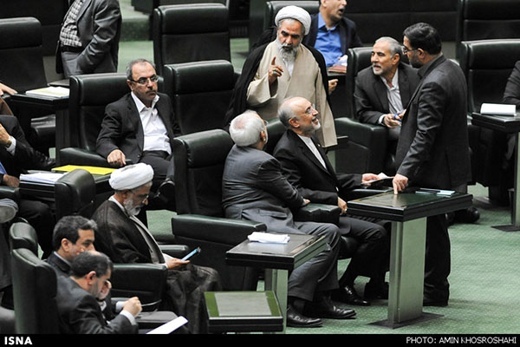 What happened in the course of the JCPOA review in parliament was marginal. What we are dealing with now is a text pitting a Muslim nation against the enemy, or I should say the number one enemies, of Islam and Iran! Opponents and proponents of JCPOA should wait and see which one of the following has been sensible: trust in the US or advice to stay away from deal breakers, enemies and devils.